I played the first edition years ago when it first came out. That was the early 90's. No other game at the time captured my attention like Space Hulk did... and still does. The elegance, the simplicity, the pace, all of it. From a design standpoint, I think it plays absolutely wonderfully. Volumes have been written about the game and its mechanics. 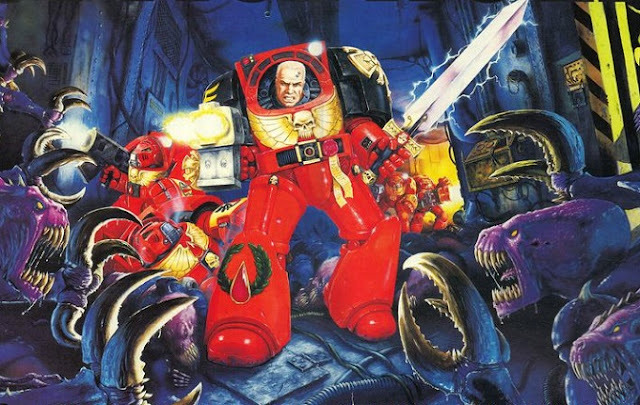 Even though the first set came with Blood Angels, Space Hulk is how I came to fall in love with Dark Angels and more specifically Deathwing Terminators. After seeing them and reading their story in the Deathwing Expansion booklet, it was love at first sight and I never looked back. Having rediscovered the fun in Space Hulk when 3rd edition came out a few years ago, my friend and I set out to play as often as we could and continue to play regularly to this day. He was the first one between us to buy a copy of the updated edition and it wasn't until I saw the quality of the game pieces that I broke down and got a new copy for myself. I've always loved the game and it wasn't tough to get him hooked. Like a duck to water, he took to the game and regularly bests me as both the Marine or Bug player. And I don't cut him an ounce of slack either. He is a worthy opponent to say the least and has an incredible skill for writing a custom mission that is both brutal and balanced at the same time. The only thing that saves me is my unbelievable luck when it comes to dice rolling (which is a very touchy subject with him). When we initially started, we decided we'd play through all the missions in the book. You know, play the whole campaign from start to finish. Why not right? It didn't take long to figure out we wanted to start changing things to suit our gaming style. He ultimately suggested we post our "rules" online so others could see what were up to. At first, I was against the idea... I've already done the whole blogging thing thank you very much. But then I began to think about it. A small site like this could help others with the game and maybe be a way to share our ideas and pick up some new ones at the same time. Part of this is selfishly motivated as well, hopefully the feedback from you all will help with new ideas and potential improvements we might want to try out in our games. I'd be lying if I said we came up with all our changes on our own. And that brings us to where we are today. I have a good bit of information to share and I'll be writing it up and posting it here for everyone. 1. Thoughts and lessons learned from playing Space Hulk. 2. Posts that discuss how we got to the rules changes we made. On the internet you often just see the end result without ever seeing the work or thinking that went into getting to that particular end result. 2. I'll post our complete set of rules changes once I get them typed up. I'll keep it updated as we change things too. It's an ongoing process as we get better both at playing and understanding what rules we want to change and what rules we don't want to disturb. On top of that, my friend has recently completed a 5 mission campaign we've playtested extensively. I'll be posting that mission book as I soon as I get it typed up as well. Both files will be easy to download PDFs when completed. All that being said, if you play Space Hulk, I'd love to hear what you're doing with your games. IMAGE: Games Workshop. Terminators facing overwhelming odds... again.